Hello everyone; once again it is I, Chess the purebred border collie, here to bring you the latest and most up-to-date news from our garden. You may remember me from such informative and fascinating posts as “The Seed Whisperer” and “The Grape Bush”, among so many, many others. Here I am in a characteristic pose. So it’s the last day of March, and tomorrow is April Fool’s Day. The guy I live with decided today would be a good day to move chollas into the front yard, and that’s something I have no intention of helping with, no matter what. 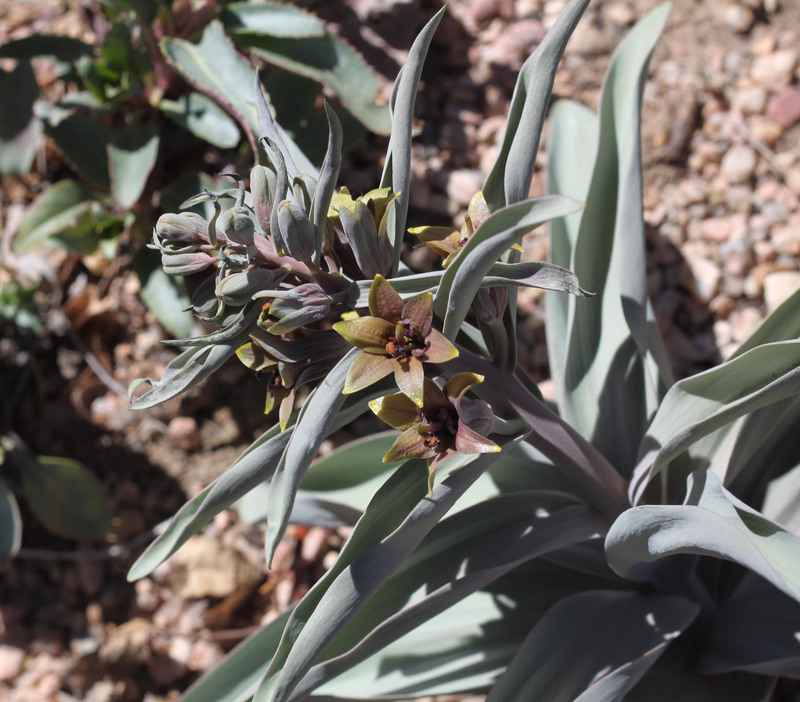 He was really careful, and I didn’t hear any colorful language, so the chollas must have been planted successfully. Instead of falling on him and stabbing him with spines everywhere. He took some pictures, too. It was fairly cool and windy today (it’s supposed to snow tonight, tomorrow, and the next day), so some of the flowers weren’t completely open, but the guy I live with said you can’t count on the weather, just like you can’t count on almost anything, though my legs gave out on the stairs when I was walking up them, because the goofballs make them slightly weak, and he helped me get back up, and he said I could count on him doing that as much as I needed. 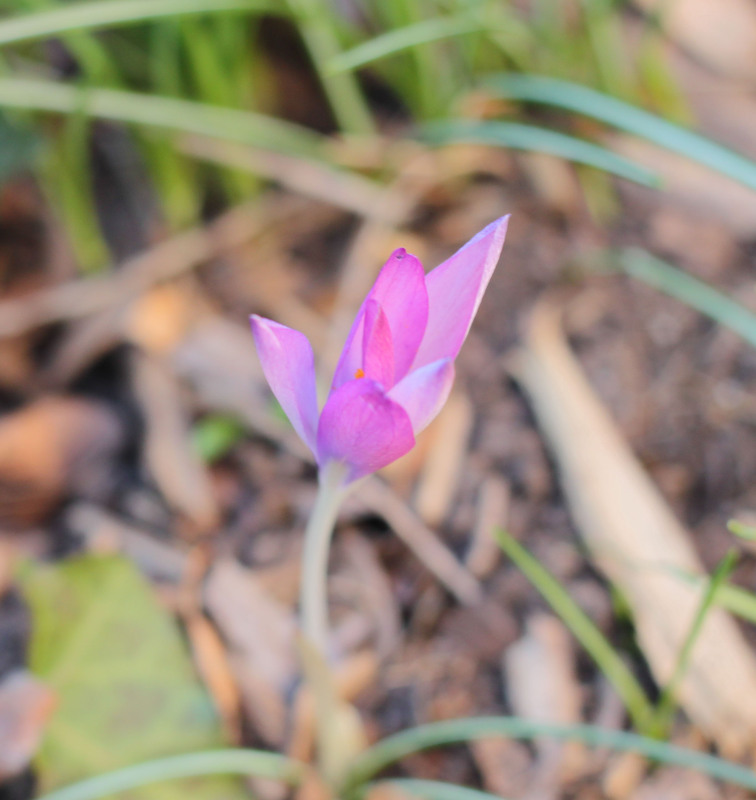 Here’s the little tiny tulip, Tulipa sogdiana. And Korolkowia sewerzowii. (The plants got chilled a couple of nights ago and have decided to “lean weirdly”. They’re going to get covered for the next couple of nights……if he remembers.) 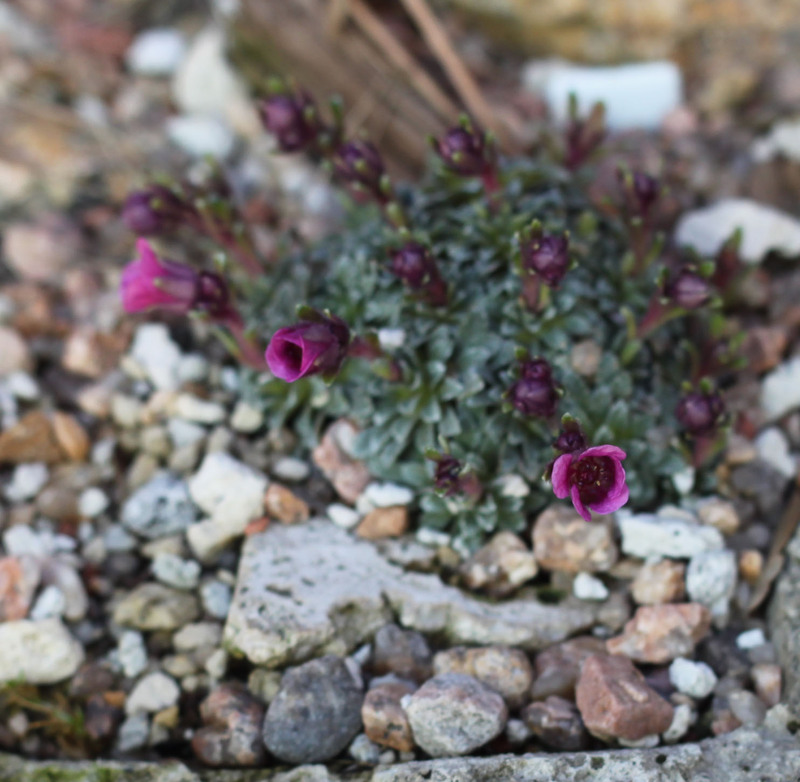 The porophyllum saxifrage, ‘Romeo’. These are several weeks later, but we don’t care. While the guy I live with was wandering around looking to see if there was anything worth taking a picture of, I checked out the “burlap lawn” in the way back. You can see how bright the sun is here. Oh, and the chewed bit on the 4×4 there, that was done by my buddy Slipper, who liked to gnaw on wood when he got really excited. Like he was a giant rodent or something. 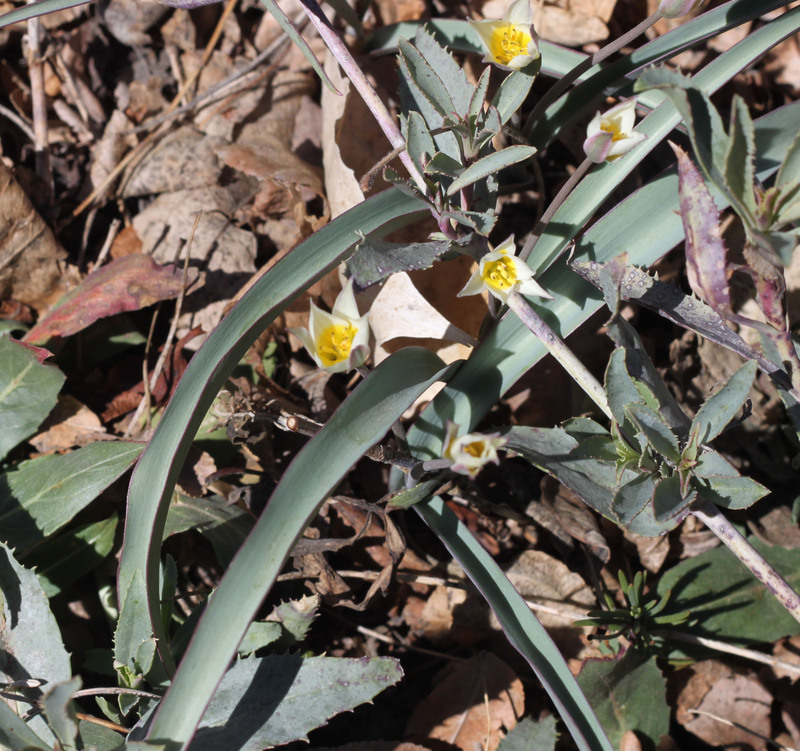 In the side yard, the shade garden, there are some late forms of Crocus tommasinianus blooming, but they weren’t completely open today. Here’s ‘Barr’s Purple’. Kind of a dumb picture, if you ask me. But here, he found a seedling, which is almost pink. Pretty strange color for a crocus. He said we might propagate this and make a fortune, or, then again, we might not. Let’s see. Oh, I know. The guy I live with left me alone yesterday to go to the cactus sale at DBG (the one he told me he wasn’t going to go to because he has over four hundred cactus seedlings and how could anyone possibly need more), and, believe it or not, he only bought a few cactus, though he wanted more. Almost all the cactus he got were ones which have to stay indoors, he says, because we don’t live in southern California or Arizona, and they all came from the Rio Grande Cacti table. 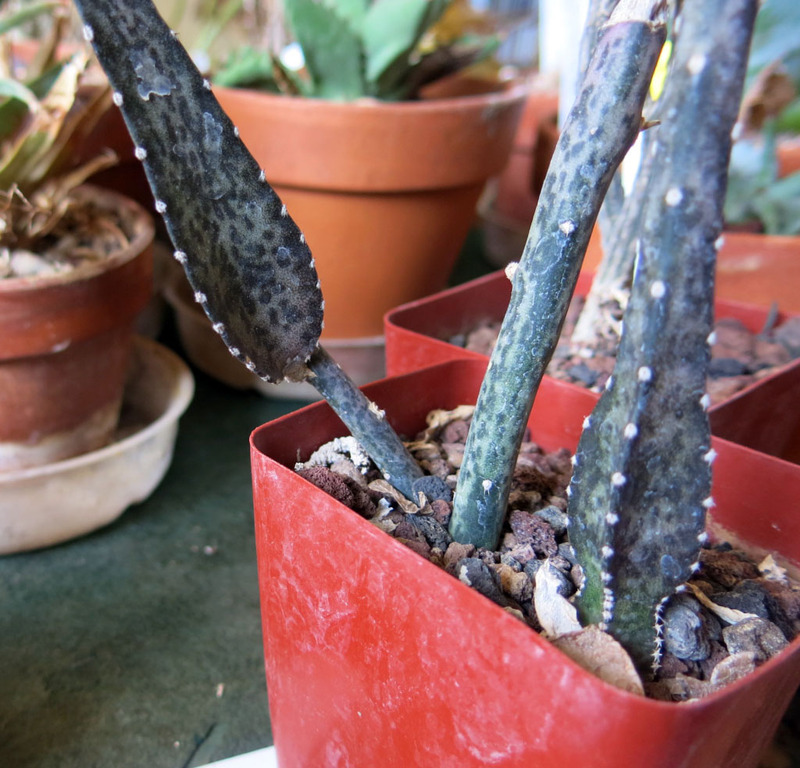 This is one of them, Peniocereus maculatus. He says it was so cool looking he couldn’t resist. What else? Here’s the foliage of Allium cardiostemon. 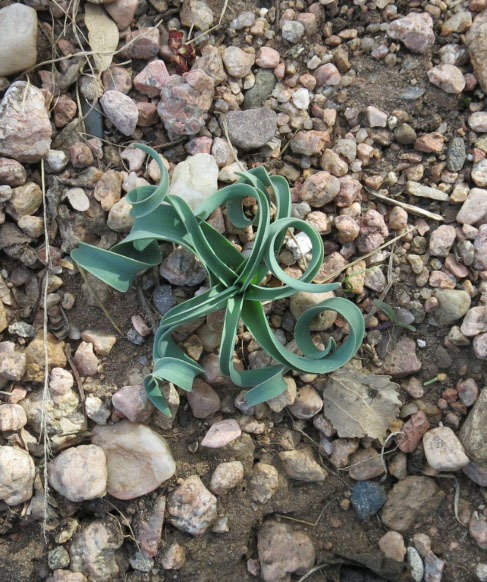 The guy I live with says there are some bulbs from South Africa that have these coiling, curly leaves, too. I think that’s it. Tomorrow is April. The guy I live with says April is more interesting than March. I’m going to retire to my fort now, if you don’t mind. 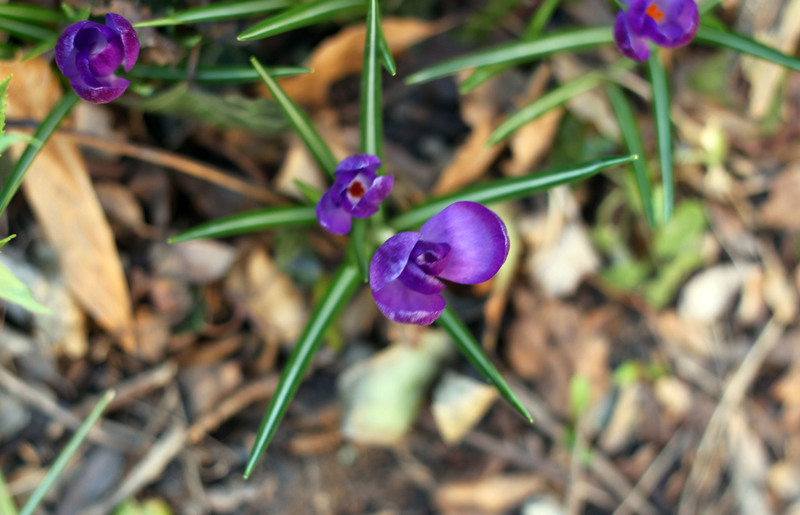 This entry was posted in Uncategorized and tagged Crocus tommasinianus Barr's Purple. Bookmark the permalink. I went out and inspected how much grass I have to weed out of the beds. I’m all for the fort idea now too. The guy I live with says that there is nothing more irritating or frustrating (he doesn’t bother with “bigger” things) than having grass invade the garden. There are endless expanses of smooth brome just waiting to invade the garden here, and it’s ineradicable. The guy I live with said that we might have to move just because of this grass. Some people spray with things like fluazifop, but not here. I came home from my road trip the other day, surveyed my domain to see what had sprouted or bloomed in my absence, and found the tulips I planted in January (because they guy you live with said it was ok) had bloomed. They were supposed to be white with a blue center, but there’s not a speck of blue on them. Very disappointing. I took my frustration out on the Bermuda grass invading one of the beds. And digging holes to plant the 6 downy serviceberry bushes that arrived while I was gone. Very therapeutic. Digging out grass can sort of help frustration (there seems to be a theme here), but if it comes back, which it seems it needs to a lot, it can be even more frustrating. Digging holes is fun, though. The guy I live with digs a lot of holes. Bulbs that turn out to be not what they’re supposed to be can be annoying, too. We have serviceberries in the garden here, too, but Utah ones (Amelanchier utahensis). There were some here a long time ago and they got fireblight, and the guy I live with dug them out, but decided to try them again. I think maybe there’s a Battle of the Grasses video to be made. I’m pretty sure my invasive grass is way worse than yours. In the movie 42 (about Jackie Robinson), there’s a scene where Robinson & Branch Rickey are overlooking a stadium during spring training in Florida, and Rickey (played by Harrison Ford) comments about how much he likes Bermuda grass & wishes they could get it to grow ‘up north.’ I screamed a little bit. Jaws is more like it: Be afraid; be very afraid. I finally remembered to look up Utah serviceberry (even though I didn’t write it down in my handy-dandy notebook), and from the photos, it looks like it has bigger/prettier blossoms than the downy serviceberries do. In the process of looking that up, I learned that Native Americans used the downy serviceberries to make bread. Pretty cool. Maybe they do. The chief advantage, here, is that they don’t require any irrigation, once the roots grow into the surrounding soil. Hi Chess, it looks bright and sunny in the garden today. That was an unusual pink for a crocus, very pretty and I loved the curling foliage of allium. More cactus, how could you I hear you say. You checked out the burlap lawn but didn’t give us your opinion. Hey Chess like Slipper I loved to gnaw on branches of any sort in the garden when I was a puppy which my mummy didn’t mind because I never chewed anything in the house unlike the last dog that demolished tables, chairs, several antiques, pens, purses, phones, she would stand on her hind legs to reach things. Mummy said you could watch her walking around like she was shopping and during the night she would get what she wanted. Sorry your legs sometimes give out but it’s nice to know your guy is always there for you. Shopping, ha ha. 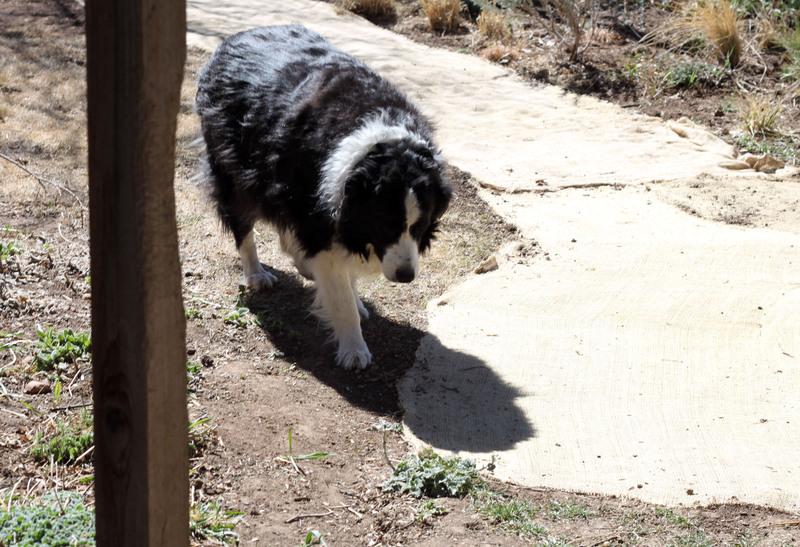 Border collies as a rule don’t chew things, but my buddy Slipper got very excited at times, over who knows what, and went a-gnawing. My grandpa Flurry pulled on the chain link fence out in back, wore out all four canines, and they had to be extracted, one by one, which ruined his looks, according to my mommy. Oh, he also chewed the Ficus benjamina which is in the upstairs bedroom and you can still see the scar. I don’t really have an opinion on the burlap because I know what’s to come. Nice soft grass for me to lie on and watch the guy I live with dig out the grass (the smooth brome) invading the way back garden, though the language he uses while digging out the grass is embarrassing. Aren’t Ficus benjamina the toughest plants on this earth. My mum had four in pots way too small for the plants, 8″ pots 8′ plants, which she never ever watered over a 15 year period. They were left behind because she always hoped they would just go away as they did not receive a drop of water from her and as you know it never rained, they were still going strong when we left, they probably had a terrible fate from the new owners. They seem to be extremely tough. Except when they get moved, then they drop all their leaves, and grow back new ones. There are excellent ficus stories in the Remarkable Trees books, forget which book exactly. For years it was potted in this stunningly ugly pink plastic pot, and then one day the guy I live with bought a new pot for it, and now it looks pretty good. Yes, you can’t trust the weather. I planted yesterday – lavenders, asclepius, matillija poppy – in anticipation of predicted rain. As I sit here it is bright and sunny as usual. Nothing works like a good downpour to water new plants into the earth. I did not know tulips could be so tiny. Tiny is always cute. You are not so tiny, dear Chess, but you totally dominate your fort with cuteness. 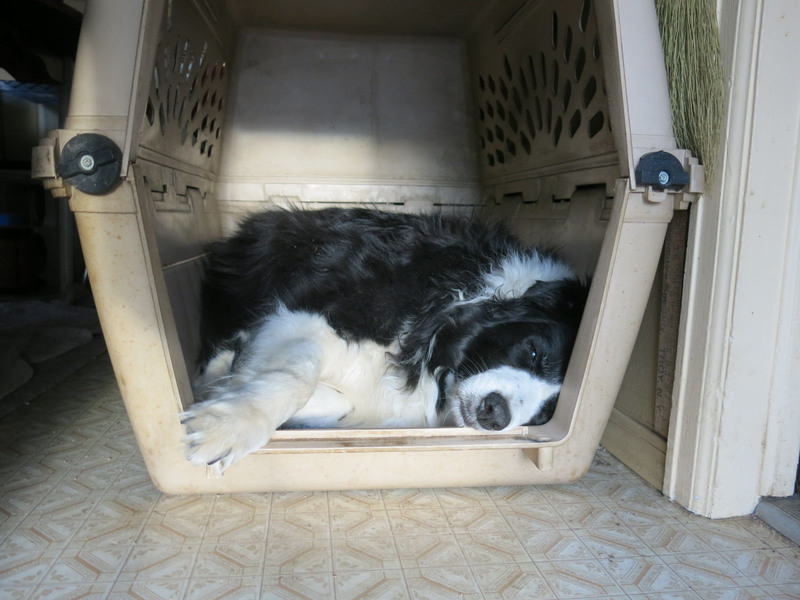 I may get a fort for my dogs just for the cute, although Petey and Shredder do not offer the inherent cute of a purebred border collie and especially one named Chess. I think I would agree that few creatures are as cute as I am. 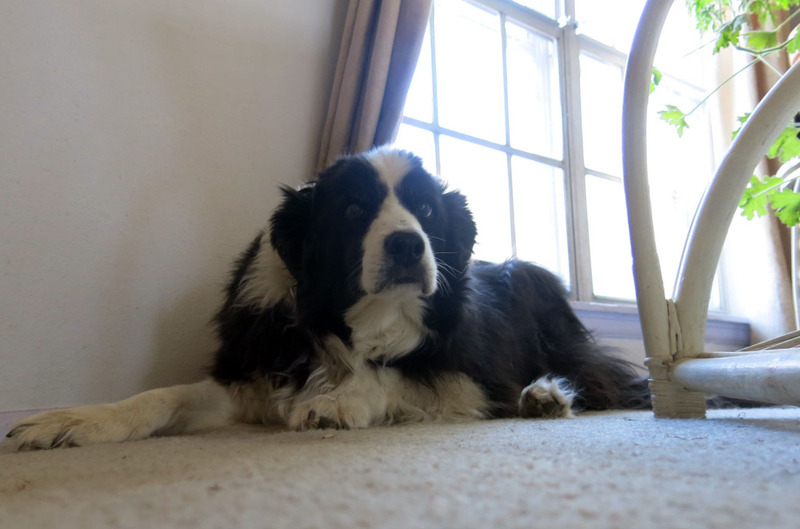 Though the guy I live with says that Petey and Shredder are really cute names, and that if you Google “Chess the purebred border collie” you get oodles of pictures of me (naturally) but also some very cute puppy pictures which are not of me. Years ago there was an article in Sunset Magazine about matilija poppy, and it said it was hardy for all Sunset zones (even though they seem to think that the entire Front Range is one zone), and so he sowed some seed. Contrary to what you read, the seed doesn’t need smoke or fire to overcome the germination inhibitor, it just needs something. (The guy I live with told me about smoking seeds in the sixties, but I didn’t get it.) He got plants, which he gave to DBG. Now, if you can put the seeds outside here, and they germinate, what does that tell you about hardiness? (He also has some fremontodendrons in the laundry room which he germinated the same way.) Turns out that matilija poppy is ultra-difficult to establish, and so every year he plants several, hoping one will come up the next spring. Most of them die before autumn arrives, and we think we’ve given a pretty good impression of how dry this garden really is. (Though they grow it in Ireland.) One of the genius-type things the guy I live with thought of is that maybe somewhere in the garden there’s the right place for one, and so he plants them all over the place, thinking that one day he might plant one in the right place. Well, he also has this Law. He formulated this Law when he worked in telephone repair. It goes something like this. “If you start at one end of the street, the trouble will be at the opposite end. So, if you think that by starting at the opposite end, you’ll find the trouble, it will be at the end you should have started at. So, if you decide to start at the first end….” I think you can see where this is going. Of course the one place where the poppy would be happy is the one place where he wouldn’t want it to grow, but he’s not sure where that is.